Locally owned and operated, Alpine Water Store was established in 2002 by Frank and Robyn Goertzen to provide pure, clean drinking water to commercial and residential clients in Grande Prairie and surrounding areas. All of our water is bottled locally and purified by a commercial 14-stage reverse osmosis purification process. 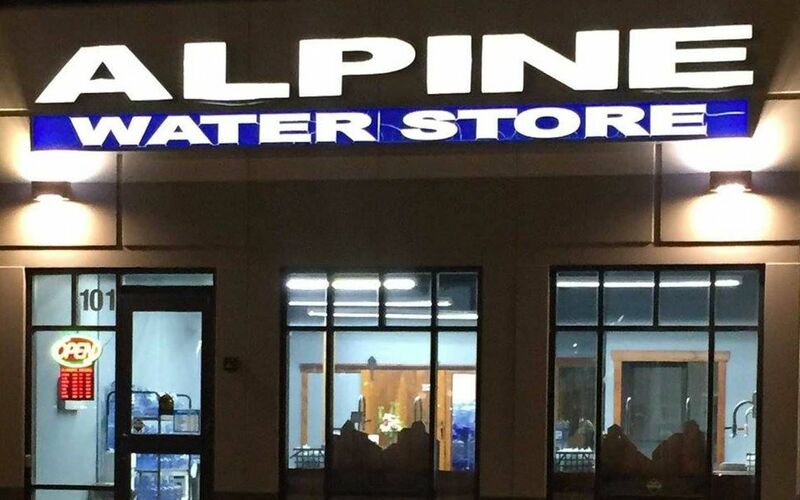 Great customer service, convenience, and providing customers with a high-quality product are Alpine Water Store’s top priorities. Fully licensed and insured, we’re an accredited business with the Better Business Bureau that strives hard to maintain an A+ rating with as few customer complaints as possible. That’s because we’re dedicated to meeting or exceeding your expectations for outstanding products and services that guarantee your continued satisfaction. We also regularly give back to our community in the form of sponsoring local organizations with bottled water donations. Some of the organizations that have enjoyed our past sponsorship have included Explosion Dance and the South Peace Horse Club. Please take a look at our submitted testimonials to learn more about the Alpine difference in customer service and continued community support, and then feel free to contact us for more information about our many great products and services. We look forward to doing business with you! Photo Credit: We would like to thank Shannon Shomody Photography for all of the amazing photos of our products that have been used on our website! A 24-hour water fill-up vending machine is located at the south door entrance for your after-hours convenience.